I’m cooking dinner for 10 tonight, and wanted something easy for dessert that would feed 10, be child-friendly, and use up some of my winter citrus stash – particularly my box of blood oranges. Liz Pozmyk has written a lot about things to do with this wonderful citrus; I’ve mostly been eating them straight or drinking the juice apart from making some blood orange curd. So I was browsing through my cookbooks looking at various cakes and puddings when I stopped in the middle of the fabulous Domestic Goddess at the Easy Almond Cake. 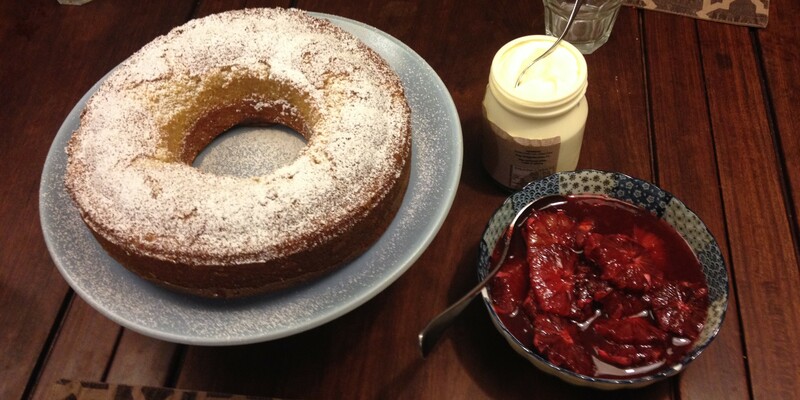 Nigella’s recipe showed the cake with raspberries, but mentioned also serving it with sliced oranges in syrup. The combination sounded wonderful, and because the oranges are served separately, it also means the children can just have cake with cream if they like. So I made the cake, following this recipe, but substituting the zest of one blood orange for the vanilla. A word to the wise, really don’t ignore Nigella’s warnings about lining the tin, or greasing and flouring well if it has a patterned base, as this mixture tends to stick – as you can see!. Thankfully she’s also right that icing sugar covers a multitude of sins! Rather than plain oranges, I served it with these wonderful blood oranges, sliced into a blood orange syrup, which is the most fabulously unrealistic and slightly gory colour (i’m afraid my photo doesn’t do it justice), and cream just because. Combine the unstrained juice and sugar in a small saucepan and heat gently until sugar is dissolved. Simmer until reduced by about 1/3 to a thick syrup. Cool completely. Using a small, very sharp knife, cut the ends off the four blood oranges and then standing each on end, cut all the peel and pith off, working from top to bottom down the curve of the fruit. Slice each orange thickly into five or six slices and add to the syrup along with any juices. Now this is something I love – adapting a recipe to suit what you have on hand. Creative tweaking. Definitely going to try this one! But those delectable blood oranges have finished in my part of the world. I have mulberries coming on, though. If raspberries are a good match, then why not mulberries? Absolutely fresh mulberries, why not! I think they would be fabulous either fresh or cooked lightly into a not-quite-jam-ish sauce – both with thick cream of course! whoah this blog iss wonderful i really like reading your articles. information, you cann aid them greatly.